Andolu Efes Istanbul led from start to finish in sinking Panathinaikos Athens 78-64 at Abdi Ipekci Sports Hall to pick up its first win of the Top 16 on Thursday night. 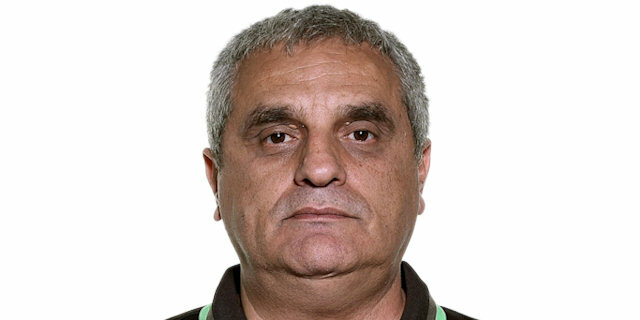 Both teams have 1-1 records after two games in Group E. As Panathinaikos was without injured guard Dimitris Diamantidis, Efes got off to a quick start. Joshua Shipp and Jordan Farmar each hit couple of three-pointers on the way to build a 22-9 lead, and the hosts never looked back. 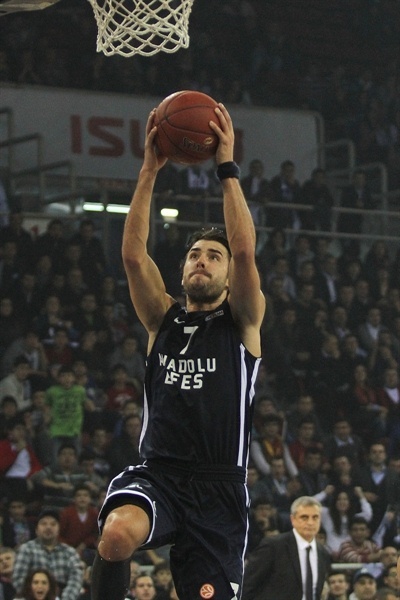 The margin reached 21 points in the third quarter as Efes cruised to victory. 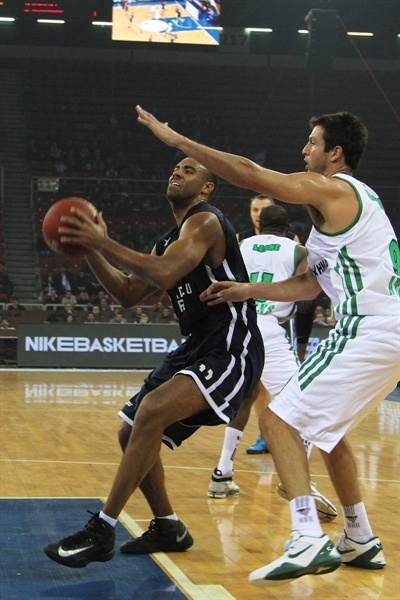 Farmar led the way with 13 points, Jamon Lucas finished with 12 points and 5 assists and Dusko Savanovic scored 11. For Greens, Michael Bramos scored 12 of his 16 points in the first quarter while Sofoklis Schortsanitis piled up 14 of his 15 points in the final 10 minutes. 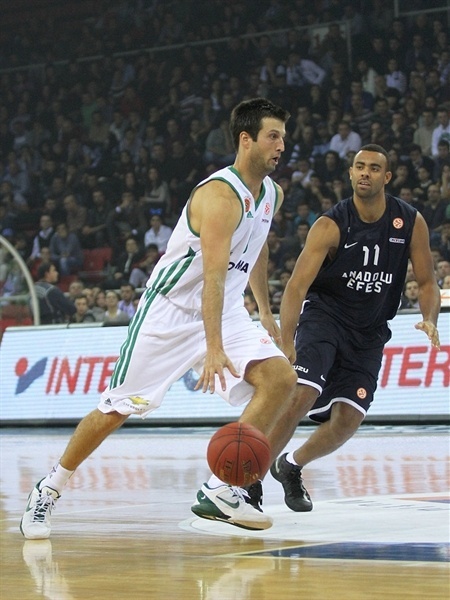 Jason Kapono added 10 points and Stephane Lasme grabbed 10 rebounds along with 6 points in defeat. The scoring started with Shipp hitting a three-pointer from the right corner. James Gist made a bucket inside to open the Greens' account, before Shipp and Farmar hit back-to-back triples making it a 9-2 advantage. Jonas Maciulis answered with the first shot from downtown for the visitors, but Semih Erden, Lucas and Shipp contributed in another 9-2 spurt capped with a three-pointer by Farmar for an 18-7 advantage. 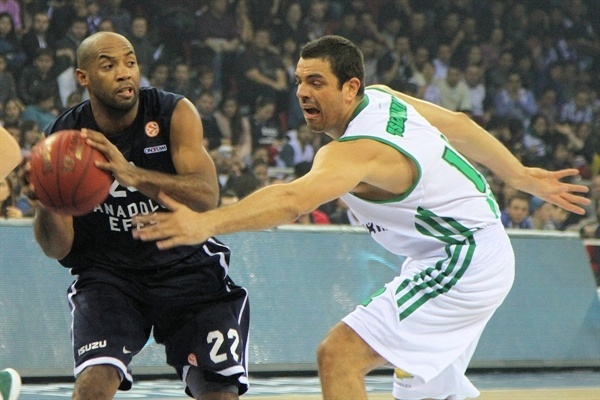 Bramos tried to get Panathinaikos going, but Erden and Savanovic extended the margin to 22-9. Bramos, however, proceeded to score couple of triples and a fastbreak dunk in a string of his 12 straight points to get the visitors within 24-17 after the first 10 minutes. At the start of the second quarter, Bramos continued his run with another three, making it 15 points in a row. But, on the other end, Kerem Gonlum scored twice from close range and Stanko Barac floater extended the Efes lead to 32-23, before Lucas hit a jumper to push the lead into double figures. Roko Ukic answered with a coast-to-coast driving layup, and Kapono hit a baseline jump shot for the Greens, but a three-pointer by Savanovic made it once again a 13-point affair. Gist twice found a way to score inside and get Panathinaikos closer, but Farmar answered with his third triple as Efes took 45-32 lead into the break. A pair of free throws from Sasha Vujacic got things started for the hosts in the third quarter. While Erden kept control of things in the paint on the defensive end, Lucas, Farmar and Vujacic made layups to extend the lead to 53-32. 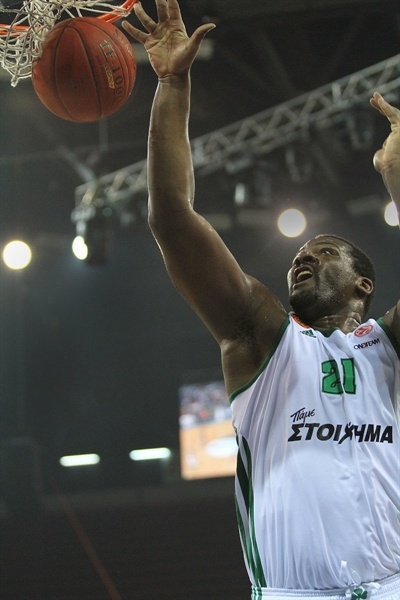 Panathinaikos was not allowed a field goal for more than four minutes until Lasme dunked. Lucas nailed a jumper, before Lasme added 4 more points and Kapono sank a triple for 55-41. Before the quarter ended, Gonlum and Lucas hit jump shots for the hosts and Sinan Guler made a shot behind the arc to push the margin to 64-43 after three quarters. There were no points on either side for more than three minutes at the start of the fourth quarter, as it was becoming clear Efes was on its way to victory. Schortsanitis scored twice inside for the visitors and Maciulis hit a jumper to cut it to 64-49. Even though the hosts failed to score for more than five minutes, their lead was never in question. 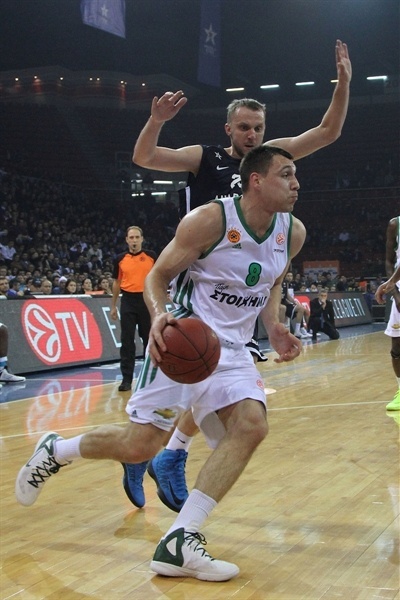 A monster-dunk from Erden ended the drought and a layup from Farmar made it 68-50. 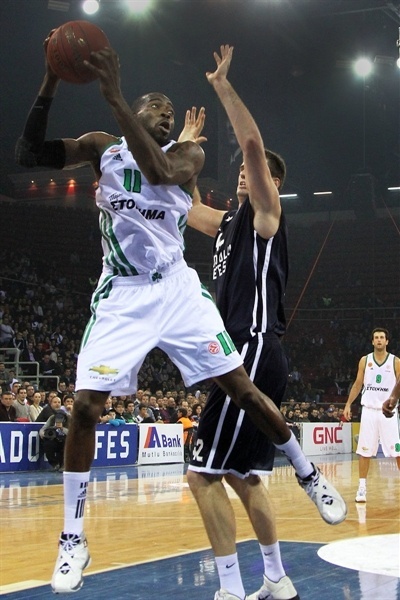 Panathinaikos, on the other hand, went inside to Schortsanitis on every possession, and the big man strung together 10 more points. Kapono made a three-pointer to make it 76-64 before Vujacic hit an off-balance buzzer-beater for the final score. "We took a very important wın tonight. We controlled the game from the start until the end. We had a good rhythm in offense, especially in the first half. We extended the difference at the beginning of the third period, but then we failed to save it for a couple of minutes. It was good to back in rhythm then to get a respective advantage before the last period. We were far away from the game mentally in the last period, compared to how we played in the first three quarters. The difference reduced, but it's good to win this game. If we had remained stable, the margin could have been larger." 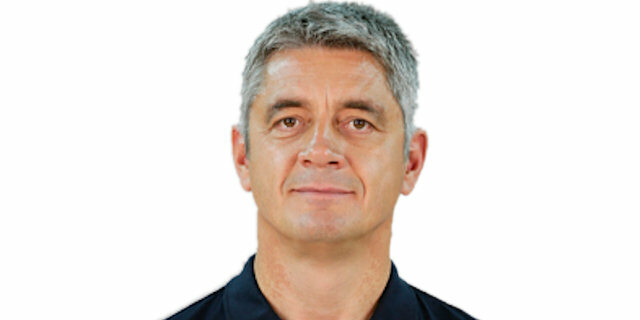 "Anadolu Efes had a very good start in the game. We couldn't able to do what we planned before the game. We were too soft in defense. 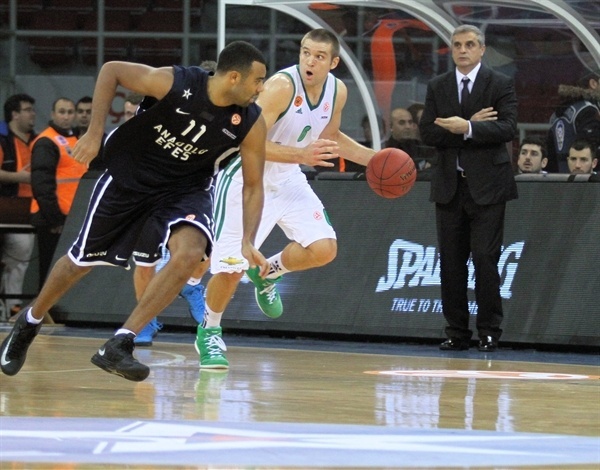 Efes took the control of the game in a little while. It's not because they were shooting incredible, it's because we were very weak in defense. Then Anadolu Efes players had their confidence and played the game they wanted to win. We have to work on our mistakes."